Using a fairing batten (any strip of wood that bends in a fair manner), verify all of the shaping of the longitudinal structures. Sight along the batten flexed across the members at various angles. Take your time and ensure that everything is right. When you are confident, move on to the next step. Make sure the jig can be easily removed from the hull. Take a few minutes and verify that release tape, either masking or packing, is applied to every part of the jig where epoxy might squeeze or drip on. Ensure that there are no screws that will interfere with the removal of the jig once the boat is flipped. When you are confident that you will have little trouble removing the jig, it is time to plank! The end result of the planking process should be the creation of a unified monocoque structure as described in the Stage 1 - Overview of the Cold Mold Process. Key to this process is proper joints at the "corners". This will be described a little later. To start the planking process, it is typically easier to begin with the bottom where it meets the transom. The planks should lay at an angle of about 22-25 degrees relative to transom which would create an approximate angle of 45 degrees between the planks layer to layer. This is optimum. As the bottom is comparatively flat, especially at the transom, the first planks should be relatively wide. Making them as wide as possible will reduce the work. The planks should be left long enough to overhang both the keel and the chine. When you dry fit each plank, make a small mark at on the plank at the "point" of the chinelog and keel. This will help greatly when it is time to trim the planks after gluing. The planks have to take more and more bend. The mere fact of bending flat plywood around a curved mold can (and will) cause the edge of a plank to fall into a compound curve. The planking angle will slowly change. More bend: The planks have to get narrower. The more compound the surface, the narrower the planks. The "appropriate" width of the planks is impossible to plan or predict without bending wood onsite. It is done by feel. Compound Curve: As the plank is bent around the jig, it is forced usually to do some bending in two directions. This is a compound curve. When that happens, the edge of the plank relative to the next plank rarely remains straight. Note: The illustration is simplified by depicting the process in only two dimensions. Clearly, the process happens in three dimensions. We just feel that illustrations depicted in 3D would be very didfficult to follow. We feel that a 3D illustration should be a video. At some point, we will augment these methods with video. Frame 1 Shows a plank (Plank A / shown in red) prior to bending it around the jig, as you can see, it is sawn from the sheet of plywood and both edges are parallel. Frame 2 Shows the plank after it is bent around the jig. The next plank (Plank B / shown in grey) has been laid next to it for reference to show that the two planks typically don't fit together all that well. The scribing process typically begins here. The fundamental process involves transfering the line of the edge of the previous piece to the next piece so it can be cut along that line enabling the pieces to fit tightly together. There are many tools that can be used to effectively transfer that line. The simplest of which is an ordinary compass typically used to draw circles. It is usually easier to scribe if there is a slight separation in the planks. Therefore, you see that Plank B has been moved slightly away from Plank A.
Frame 5 Remove the clamps and proceed to cut the new plank at the line using a bandsaw or a jig saw. Frame 6 If you were accurate with your drawing (by keeping the compass at a constant angle relative to the old plank) and cutting, the new plank will fit perfectly. That is all there is to scribing! It is usually more difficult to describe than to do it. You will get the hang of it in just a couple planks. Changing angle: This is caused by a difference in length. To quickly understand this, imagine wrapping a string around the boat at the chine. Now do the same around the sheer. The string around the sheer will be considerably longer. To keep the planking angle relatively constant, every now and then, you have to cut a plank into a slight wedge shape. There is a word, spiling, from the old days of wooden boatbuilding which is used to describe the process of "fitting" planks. Although the the process of building boats in the "good ol' days" using planks over frames is significantly different, the same word is also often used in cold mold plank fitting. When you are at the place where you feel that it is time for an "adjustment plank", lay a batten on the boat tight up against the previous plank. Now, slide one edge of the batten away from the plank until the angle approaches the target adjustment. Now measure the width of the gap between the previous plank and the fairing batten. Lets say that it is one inch. Now, on your table saw, rip the next plank approximately one inch wider than the previous plank. The exact dimension is absolutely not critical. Now, clamp the next (wider) plank in the same orientation as the batten leaving the same one inch gap. Now simply scribe as describe above. Tthe new plank will fit perfectly and adjust the planking to the angle desired. We often get questions regarding the inevitable "fish-scaling" that occurs when trying to create a compound surface by using strips of flat plywood. Clearly, excess fish-scaling should be avoided by first trying to select the appropriate width planks. Next, take care in the scribing process. However, the cold mold process can tolerate some degree of fish-scaling. You can imagine that some might even be inevitable as you are attempting to bend flat plywood around a curved structure. The process can tolerate some degree if you ensure that you don't put glue between the planks when installing the first layer. Part of the job of the second layer is to pull the planks of the first layer fair if they require it. Again, the wider the planks, the more pronounced the fish-scaling can be. So, when trying to determine the approprate width of the planks for a given section of the boat, keep this in mind. Even if you can get the planks to do what you want from a bending perspective, you must balance width against scaling. Don't push the limit of what you can expect the second layer to pull fair. Grab a plank and screw it across the joints and see what happens. If the planks resist and don't want to pull fair, they are too wide. Simple. There has been a great deal of controversy on this topic in various Internet forums. Much of this is generated by "keyboard warriors" whose motivation just might be to convince you that you can't do this. If you have reasonable skills and attention to detail, OF COURSE YOU CAN! By the time you are planking, you have worked with enough thickened epoxy to be able to reasonably estimate the amount of working time you have with your current temperature conditions. When you feel you have dry fit more than enough planks, you can number the planks from the stern forward and then remove some and begin the gluing process. Remove them in opposite order leaving the ones you will need first easily accessible. Make one last inspection. Look for things like missing masking tape. You certainly don't want to glue the boat to the jig at this point. When you are satisfied, go mix some epoxy. One trick for accurately placing a bead of thickened epoxy on the shaped longitudinals: Take a large one gallon Ziploc™ food storage bag (the kind with the physical slider for the zipper), and scoop some mixed and thickend epoxy into the bag. Ease the air out of the bag and zip it closed. Now, cut off one corner at the place where the bead will be the appropriate size. Now you have a very simple tool like cake decorators use. Squeeze beads of glue on the longitudinals, spread the glue with your notched spreader and screw the plank down. Use enough screws "padded" with fender washers to pull the plank down. When you apply each succeeding plank, try to keep from getting glue between the planks. This is ONLY for the first layer. 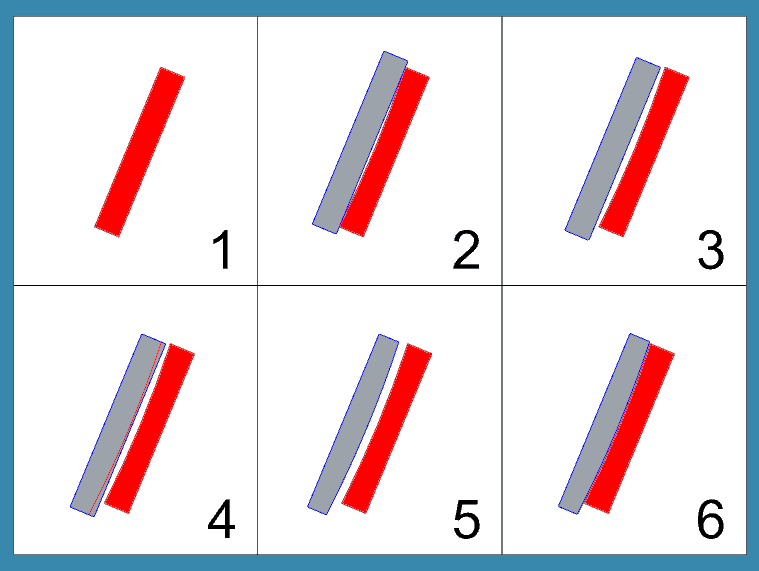 This way, the individual planks can "float". As discussed above, the second layer, laying at a relative angle of about 45 degrees to the first layer will span the planks of the first layer and pull them fair again, if they require it. Continue working from the transom to the stem in this manner. Now that you have one side of the bottom done, it is time to trim the planks. Here is where we talk about making good strong joints at the "corners". The key is to leave enough plank material (left panel of image below) to be able to properly shape it back to the underlying structural longitudinal (center panel of image below). The keel is shown in the illustration but the same message applies to the chinelog. Prior to triming the planks, it is time to talk about the Transition Point. We are often asked: "What is the best way to trim the planks?" Unfortunately, there is no universal answer to that question due to the constantly changing shape of a boat. A router with a guide bearing might seem like the quickest answer but, in reality, a top-mounted bearing will work best on one section of the boat while a bottom-mounted bearing will work better on other sections of the boat. What happens is... You will start cutting and not realize that the angles are changing and end up routing into a structural longitudinal in a different part of the boat. So... as much as we love template guide bits on routers, it is not the tool of choice for trimming planks in our opinion. Remember the notations you made indicating the "point" of the keel and chinelog? Take a 1/4" thick fairing batten and position it where the underside of the batten is touching the marks. Now draw a line on the top side of the batten. This gives you a slight safety margin. Probably the easiest method is to set your jig saw to an angle where you KNOW that your blade, extending out beyond the plank will not touch the structural member and then cut the plank to the safety line. Since you have previously shaped the keel and chinelog, your excellent skills with a handheld planer and side grinder will allow you to quickly shape the plank back to the proper level as shown in Figure 3. Continue planking the boat in the proper order to ensure this type of "herringbone" joint in the planking at the chinelogs and the keel. It is theoretically stronger to start with the sides so that both layers of the bottom overlap the sides. However, the trade-off is that the bottom is easier to learn the planking process due to the relatively simple shapes. We feel that it is a good trade-off because the outside layer of the bottom will overlap the sides. The new boatbuilder has quite a bit of experience by this time. Start the planking at an angle that intersects the first layer at about 45 degrees. When you dry fit the planks, you will see that one of the jobs of the second layer is to pull the first layer fair. The "fish-scaling" phenomenon that worries just about everyone when doing the first layer is taken care of at this time. Dry fit, scribing and creating adjustment planks where necessary and when ready again, go mix some epoxy. The screw holes from the first layer do not need to be filled in any way. The thickened epoxy used to glue the second layer will take care of it. Now, go mix some epoxy and glue the planks down. Ensure that you have mixed it thick enough to handle any irregularities. Typically, the consistency approaching peanut butter is about right. Unlike the first layer, when gluing the second layer, you do work epoxy in between the planks. In addition, now is the time to work the epoxy between the planks of the first layer. Use a plastic spreader like a squeegee to accomplish this. Congratulations, completing this layer is a significant milestone. Rule Number Two: If they are not stainless steel, you CAN'T leave them in the boat. Now, how do you remove them? There are a couple of ways. This link is provided as a convenience. Rockler is not affiliated with ENVIBOATS in any way. There are also more places to buy them (and they come in additional sizes.) You can simply GoogleTM "Robert Larson hollow screw extractor". Use the hollow screw extractor to saw out the wood around the screw creating a mini "dowel" rod. Pull the saw back out of the wood, and, using a small screwdriver, apply leverage to the top of the "dowel" snapping it off below the screw. Remove the dowel rod and the screw together and you have a hole that is ready for a simple plugging process. Unlike typical hole saws, these extractors, for obvious reasons, do not have pilot drill bits in the center. Therefore, there is nothing to keep them from "walking" away from the screw you are trying to extract. Simple solution: Make yourself a little jig out of a small scrap of 1/4" plywood, say, 4" x 4". Drill a hole in the center that matches the outside diameter of the screw extractor (or use the extractor itself in a drillpress). Next drill a couple of 3/16" holes out near the edges of the jig which will be used to temporarily screw the jig down. Mount the jig with the extractor hole centered around the screw to be extracted. Place it carefully as the broken screw is hardened (the main reason it broke) and it will quickly dull the extractor if you hit it. Another method is to drill a series of small holes around the screw to relieve the pressure against the threads and then grab the shank with needle-nose style Visegrips and turn it out. If no screw shank is exposed, and most of the time it isnt, then use any method available to dig out enough material to allow the Visegrips to get in there to get enough of a grip on the shank to back out the screw.